Commercial HVAC, Plumbing and Sewer Repair in Greenville, NC. As a leading full-service commercial contractor, Delcor understands the demands the commercial industry needs. From replacing a toilet at a Starbucks, to installing a 60-ton rooftop HVAC unit on a large industrial facility, Delcor has you covered. We service the commercial industry for preventive maintenance, small to large HVAC installs, minor to major plumbing, generators, indoor air quality, water filtration, walk-in coolers and freezers, mini-splits, building expansions and new building construction. We’ll work with you to set up a planned service schedule designed to meet the specific needs of your business. We understand that a comfortable environment produces a more productive business and Delcor has the professionals you need to make sure your business can run at optimal condition without delay. Give us a call today! In the construction stages of a new commercial building? No matter the industry, our professionals at Delcor can assist you through multiple stages of the construction process giving you our expert advise and completing projects efficiently in a timely manner, so construction is not delayed. Delcor has certified plumbers and HVAC technicians, we can handle all of the plumbing needs including sewer installation, heating and cooling comfort, tankless water heaters, and refrigeration. We will also be happy to set up a maintenance schedule and make any necessary adjustments to the plumbing, heating and cooling, water heater, and refrigeration units so that everything is running in optimal condition, assuring better business. 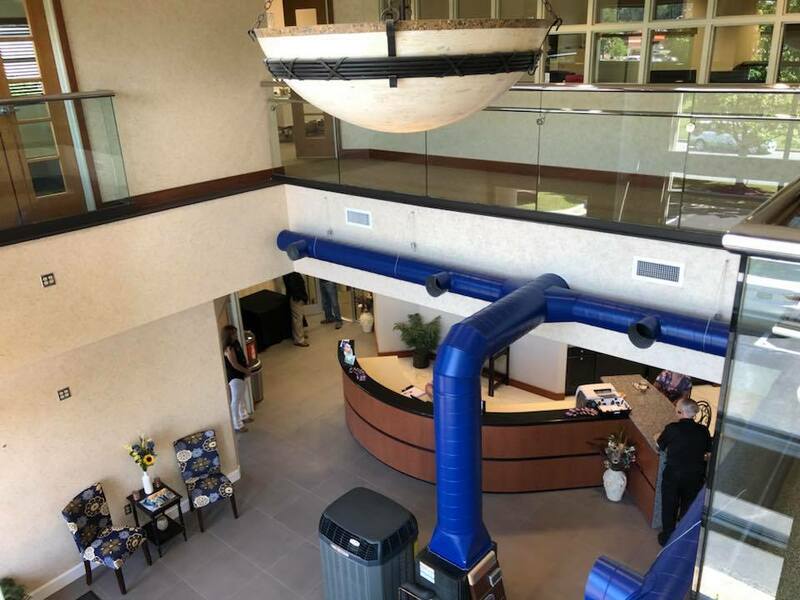 At Delcor, our commercial HVAC technicians are NATE-certified and have been thoroughly trained to resolve any commercial heating and cooling issues that may inhibit your business from running properly. We offer the industry’s leading system, Trane, to handle all of your heating and cooling needs. From repairs to maintenance, we can service and install all types of units and are available 24/7. No matter the type of service needed for your commercial HVAC, Delcor has the experts that can handle the job! In commercial buildings, major water needs include restroom activity, cooling/heating, landscaping, kitchen and other sanitation needs. Low-flow fixtures help to quickly reduce consumption and costs, yielding water savings and reduced utility bills. Low-flow technology is commonly found in faucets, aerators, toilets, urinals and showerheads. Our Delcor service professionals can handle the installation for you in a timely manner, there is no job too simple or complicated for Delcor. We can handle leaking sewer lines, grease traps, broken fixtures, and leaking pipes. With our state of the art sewer jetter and sewer camera, no clog is too tough for Delcor. Delcor excels at new construction commercial plumbing, and our emergency plumbing service department is available 24 hours a day, 7 days a week, 365 days a year. We service refrigeration systems in all types of industries including restaurant/hospitality, hospitals, medical facilities, grocery stores, and any business that uses refrigeration. We service, sell, and install: walk-in coolers, walk-in freezers, refrigerated restaurant equipment, and ice machines. We service refrigeration systems in all types of industries including restaurant/hospitalitWe service refrigeration systems in all types of industries including restaurant/hospitality, hospitals, medical facilities, grocery stores, and any business that uses refrigeration. We service, sell, and install: walk-in coolers, walk-in freezers, refrigerated restaurant equipment, and ice machines.rldwide it is apparent that climate change is affecting the ecosystem. With climate change green energy becomes increasingly relevant. Luckily, with today’s technology we have the benefit of energy efficient developments, like a programmable thermostat, energy efficient HVAC, attic blankets and fans, solar tubes for lighting, and tankless water heaters to make your home more energy efficient. The U.S Department of Energy has developed a national rating system, called the Home Energy Score. The score reflects your home’s energy efficiency based on the structure, heating, cooling, and hot water systems. Consider making your home more energy efficient and save energy, more money, and be environment friendly. Delcor has the professionals to assist you make your home more energy efficient! Give us a call for a free estimate. If the main sewer line is backed up then any water run in the house will cause problems. If it’s a secondary line backed up then the issue will be isolated to that particular line. No matter the problem the Delcor professionals can help you today!y, hospitals, medical facilities, grocery stores, and any business that uses refrigeration. We service, sell, and install: walk-in coolers, walk-in freezers, refrigerated restaurant equipment, and ice machines.rldwide it is apparent that climate change is affecting the ecosystem. With climate change green energy becomes increasingly relevant. Luckily, with today’s technology we have the benefit of energy efficient developments, like a programmable thermostat, energy efficient HVAC, attic blankets and fans, solar tubes for lighting, and tankless water heaters to make your home more energy efficient. The U.S Department of Energy has developed a national rating system, called the Home Energy Score. The score reflects your home’s energy efficiency based on the structure, heating, cooling, and hot water systems. Consider making your home more energy efficient and save energy, more money, and be environment friendly. Delcor has the professionals to assist you make your home more energy efficient! Give us a call for a free estimate. If the main sewer line is backed up then any water run in the house will cause problems. If it’s a secondary line backed up then the issue will be isolated to that particular line. No matter the problem the Delcor professionals can help you today!